This week's Tuesdays with Dorie (TWD) recipe was chosen by Barbara of Bungalow Barbara: Sablés. 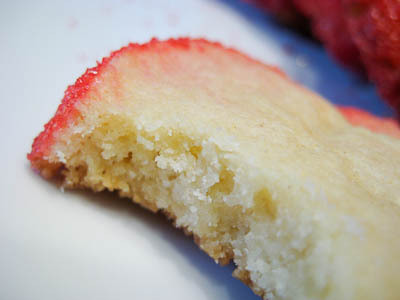 Sablés are shortbread-like French butter cookies known for their sandy texture (in fact, "sablés" means "sand" in French). This post is going to be short and sweet because I'm still adjusting to life with a newborn... but let me just say that for a cookie that is so simple to make, the outcome is wonderful. I really enjoyed the crumbly, sandy texture of these cookies, as well as the intense butter flavor. It's a shame that this recipe contains two whole sticks of butter (and yields only 2 dozen cookies), otherwise I'd be more inclined to make these more often! These would be great for holiday gift giving, though. If you would like the recipe, you can find it here on Barbara's blog. She's also got some great tips on shaping the dough into a log and how to help keep the logs from flattening out while chilling. 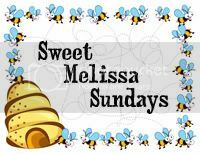 Make sure you check out the TWD Blogroll, to see how everyone else enjoyed these buttery treats. - The recipe instructions call for 2 egg yolks to be added to the dough and then an additional yolk to coat the logs before sprinkling them with sugar. The third egg yolk is not listed in the ingredients list but rest assured that the dough is supposed to contain two yolks, not just one. 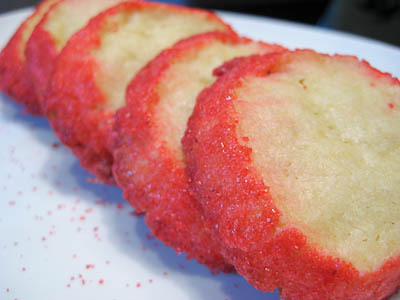 - I decorated my cookies with red decorating sugar but I think turbinado sugar yields a more classic, elegant look. 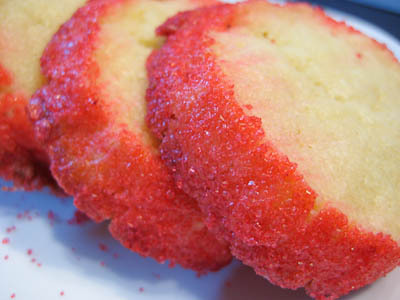 - The cookies will keep in a tin at room temperature for about 5 days. 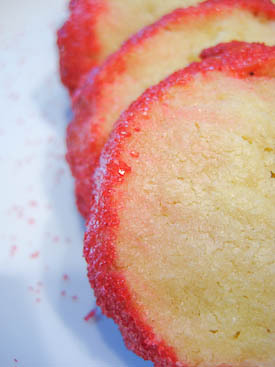 If you do not sprinkle the sablés with sugar, they can be wrapped airtight and frozen for up to 2 months. Because the sugar will melt in the freezer, the decorated cookies are not suitable for freezing. Great job on the sables Jaime! I'm impressed that you were able to bake along so soon after your daughter was born. I made the lemon version and those were really tasty too! Hang in there with the little one - kudos for still participating! Baking with babies sounds like quite the endeavor - I'm impressed! They look wonderful, and I love the red sanding sugar on the edges! These sables look so perfect jaime. Very festive too. Your cookies look great. So pretty with the red sugar. I made plain ones this time too, but think I will play around with some flavors next time. i was super confused about that extra egg yolk and re-read the recipe several times. i can't wait to bake these! good for you for carrying on with twd even with a new itty bitty person in your life. these look delicious! Great job on not only making the sables but getting the post up. You are missing one thing... pictures of Annalise. Thank you for baking along with me this week, especially with your new little one! I'm glad you liked these. Hope things are going well for you and that beautiful baby. I cut my cookies smaller and got more out of the dough. I need to stretch these suckers out, know what I mean? They look great! Your sables look perfect! Love the red sprinkles! And congratulations!!! Beautiful! Your cookies are perfect for the holidays. I hope you get some good sleep soon! I remember those days and am about to go through them again soon!